We share our secrets for success, including party-planning strategies (timing, mise en place, and organization), crowd-pleasing recipes, simple techniques for hosting a variety of parties, and impressive plate and platter presentations. 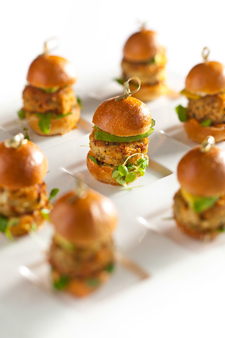 The ability to plan and execute a successful buffet is an essential skill for foodservice professionals in the rapidly growing realm of catering and special events—whether executed by an independent business or as ancillary services offered by restaurants, hotels, clubs, colleges, and hospitals. Modern Buffet Presentation successfully incorporates the art of buffet and banquet entertaining with tantalizing, current recipes; guidance on plating, garnishing, and arranging; and design concepts and visual appeal. Practical concerns for the professional are thoroughly addressed—from setting price points, selecting proper equipment, and training staff to marketing, communicating with clients, and practicing proper sanitation. Guides to menu planning, including action stations (omelets made to order) and creation stations (sushi bars), help professionals navigate the many possibilities in serving large numbers creatively and effectively. Nearly 200 recipes provide inspiration for buffet foods that delight customers while contributing to the bottom line, and more than 100 color photographs illustrate winning dishes, successful buffet setups, and platter arrangements, as well as provocative centerpieces and displays. Carol Murphy Clyne and Vincent Clyne launched PAIRINGS palate + plate in Cranford, N.J. in 2010. Their restaurant concept is based on constantly evolving seasonal recipes featured in the globally inspired, contemporary American dinner menu; the on-site buffet menu; and their cooking classes. The couple also owned a personal catering company for 20 years. Carol holds ProChef Level II Certification from The Culinary Institute of America in Hyde Park, and Vincent, a Certified Wine Professional credential from the CIA in Napa Valley. Vincent was also awarded the Signorello Vineyards Food Writing Scholarship to the Symposium for Professional Food Writers at The Greenbrier in West Virginia. Carol is currently a visiting instructor for the food enthusiasts programs at the CIA. Founded in 1946, The Culinary Institute of America is an independent, not-for-profit college offering bachelor’s and associate degrees in culinary arts and baking and pastry arts, as well as certificate programs in culinary arts and wine and beverage studies. A network of more than 45,000 alumni has helped the CIA earn its reputation as the world's premier culinary college. The CIA, which also offers courses for professionals and food enthusiasts, as well as consulting services for the foodservice and hospitality industry, has campuses in Hyde Park, N.Y.; St. Helena, Calif.; San Antonio, Texas; and Singapore.